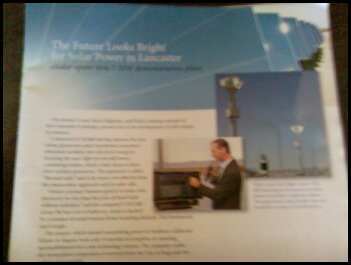 According to the title of an article published in The City of Lancaster’s Outlook (Fall 2009) magazine “The Future Looks Bright for Solar Power in Lancaster”. My small town, all 475,000 of us, are at the forefront of solar energy! On August 5, 2009, eSolar unveiled the 5 MW (mega watt) demonstration plant known as Sierra SunTower. The solar power plant has 24,000 mirrors and two giant tower house boilers. The boilers create what’s known as “thermal solar” which is said to be more cost-effective than the standard photovoltaic approach used in solar cells. The process creates steam to drive the turbine generators. The project was completed in 14 month time frame and has already begun to distribute power to Southern California Edison. The small town I live in is a “shining example” of how it will pave the way in the development of solar energy in America. We have the potential to become “the Alternative Energy Capitol of the World” as Mayor R. Rex Parris stated. This project is going take our community in a different direction on so many levels. Outlook magazine also mentioned this is the “first of many clean, green power generation facilities planned for the Antelope Valley”. To top it all off, The National Geographic Channel recently aired a program about the eSolar facility and it’s construction. I’m hoping in the near future, I’ll get the opportunity to tour the facility and share my experience with you. I would’ve never guessed that my small town had the most clear sunny days than any where in the U.S. – Do you think it’s time to get that solar oven we’ve had our eye’s on? Leslie…glad to hear that you city could become the solar energy capitol. The use of solar energy is somewhat considered expensive to supply the electrical demand of home occupants. This is no longer valid opinion. Let’s learn together how to build solar panel by ourselves. Thanks Leslie. Advantages of solar power are obvious, however, despite the developing technology solar power systems are not still that cost effective. A luxury car is not cost effective compared to an econo-box. Cars are not cost effective (or healthy, or safe) compared to walking and cycling. These facts have not changed the way the public spends. Applying a one-dimensional, cost-effect evaluation on solar power is not useful or logical or fair. 475K peope is not a small town! It is a medium city. Solar power systems are cost effective long term. I’m still waiting for solar tape. I think this will make it affordable to the masses. hi ,The use of solar energy is somewhat considered expensive to supply the electrical demand of home occupants. What If Schools Had Solutionary Teams? Eco Toy for Eco Child's Play Dad?